At our animal hospital in Oakland Park, clients can expect that their pets will be in loving hands along with the best of care in veterinarian services. We implement the best in vet technology, including respiratory care equipment and critical care diagnostic tools. We treat routine, ongoing and urgent care needs of cats, dogs, pocket pets and exotics. During the day, we operate as an animal hospital, and at night we’re an animal emergency trauma center. Clients can get medical assistance for their cherished companions 24/7. We’re a Ft. Lauderdale veterinarian serving Ft. Lauderdale and surrounding areas. Expect the best in vet care from our veterinarian Dr. Spencer Ratnoff and staff. Dr. Spencer Ratnoff is a believer in continual education and attends seminars and conferences centering on ultrasound, laser surgery and exotic animal are. With personal pets like bearded dragons, German Shepherds and macaws, he’s a true animal lover. All of our veterinarian technicians are certified and experience. We offer a broad range of vet services, including pet vaccinations, spay and neuter, microchipping, pet grooming, routine exams, dental services and emergency care. Keep your pet healthy with core vaccinations and spay and neuter. Sterilization helps prevent cancer and increases your pet’s lifespan. Plus, it helps keep down the animal population and strays. With microchipping, you have a much better chance of recovering your lost pet with its GPS tracking device. It’s a simple, painless procedure. 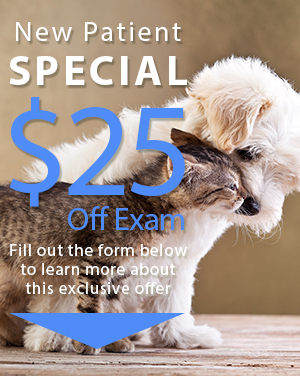 At Oakland Park Animal Hospital, we perform comprehensive nose-to-tail routine exams for pets. Our vet will inspect ears, eyes, skin, coat and abdominal area for any abnormalities. How often should your pet have a physical exam? We recommend at least once a year just like humans. Early detection of any medical problem is the key to successful treatment. Enhance your pet’s oral hygiene with our dental services. Keep in mind that most pets have periodontal disease by the time they reach three years of age. Our dental technicians remove plaque and tartar and seal the teeth with fluoride. We also perform extractions when needed. Whether your pet has been struck by a car or ingested a poison, we provide immediate care. If your pet requires surgery, we carefully monitor pulse rate, heart rate, body temperature and organ function with our state-of-the-art technology. We keep your pet at our facility until they are ready to go home. All pet owners receive detailed instructions for the best aftercare. Trimming your pet’s nails can be a frustrating experience. Let us do it for you. Plus, we offer pet grooming services to keep your companion looking clean and dapper. 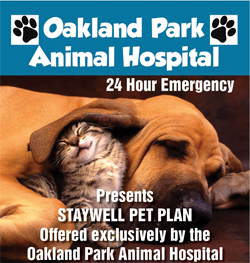 Our Oakland and Ft Lauderdale animal hospital offers all the pet services to keep your pet healthy and happy. To learn more, give us a call at (954) 731-4228.